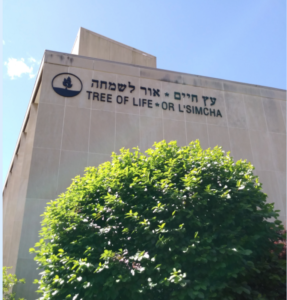 Independent Jewish Voices Canada (IJV) expresses its deepest sympathies to members of the American Jewish community following the killing this morning of ten worshippers at the Tree of Life Synagogue in Pittsburgh, PA. 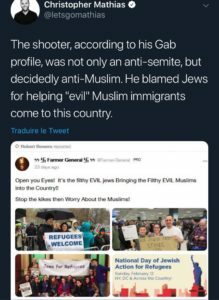 The shooter, now identified as Robert Bowers, walked into the synagogue this morning, during Saturday morning sabbath services and yelled “All Jews must die!” before opening fire. This hateful rhetoric is indicative of the dangerous rise of far-right politics around the world from the US to Hungary to Israel and Brazil. In Ontario, the fact that Premier Doug Ford has refused to denounce white supremacist and Nazi sympathizer Faith Goldy, who placed third in last week’s Toronto mayoral election, and netted more than 25,000 votes, is indicative of how these trends are growing here in Canada also. Today, IJV stands with our Jewish friends and community members across the United States and around the world who are still reeling from this attack. We stand with all communities fighting on the front-lines against the rise of fascism, white supremacy, anti-semitism, islamophobia and all forms of racism and bigotry. Today we mourn. Tomorrow we organize. To the families of the ten killed at the Tree of Life Synagogue, our hearts are with you.